After this morning’s whine, the sun returned this afternoon, drying the roads and allowing the pollinators to come back. 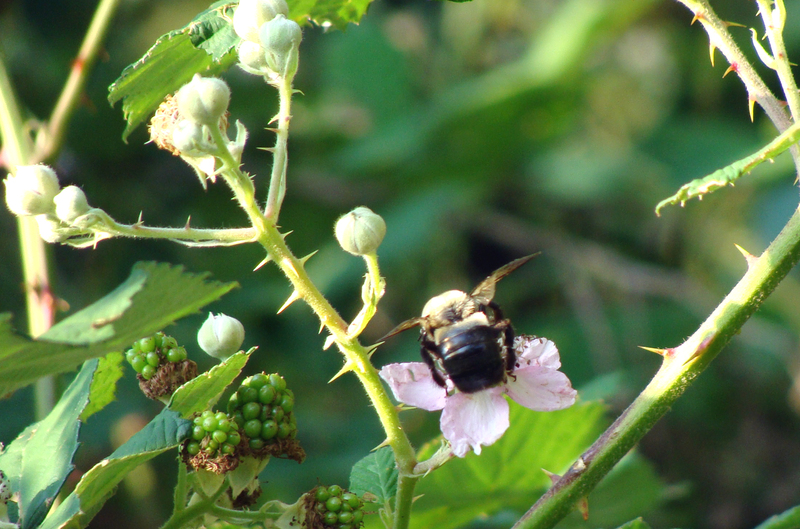 The blackberry bush was fairly buzzing. 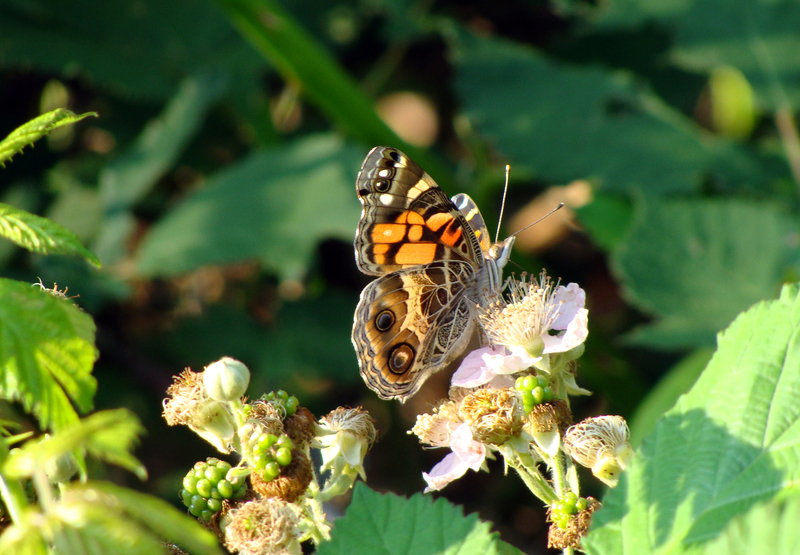 Butterflies flitted among the pink blossoms of the wild blackberry bush. Even the bumblebees got into the act. 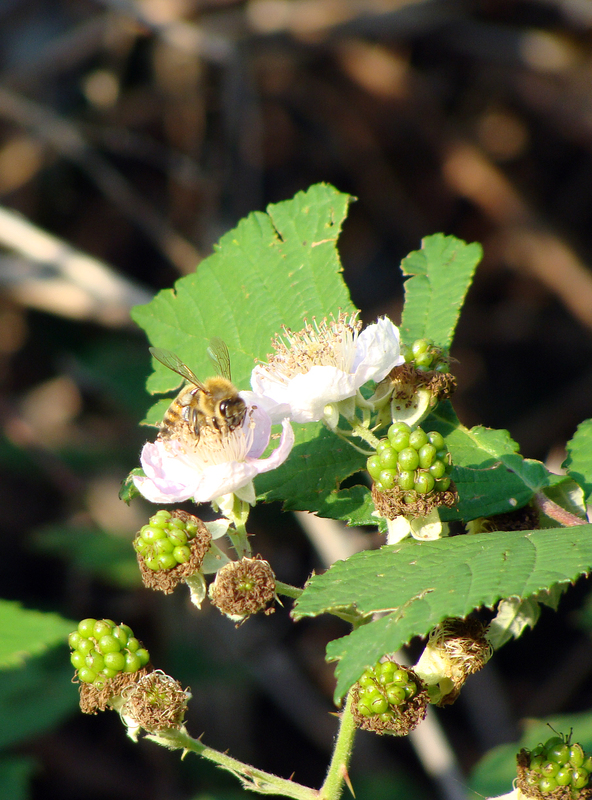 One of many honeybees working the wild blackberries. And who wouldn’t be? When was the last time we had a dry weekend? (well, OK, last weekend WAS an exception!) 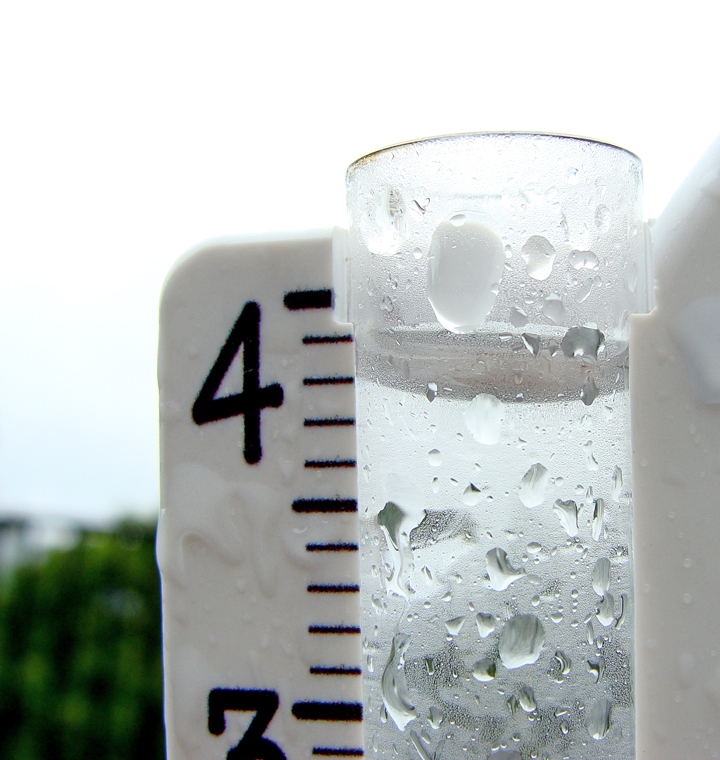 More than 4 inches of rain has fallen since noon Friday and Sunday arrived complete with another barrage of lightning, thunder and a few chunks of hail for good measure. 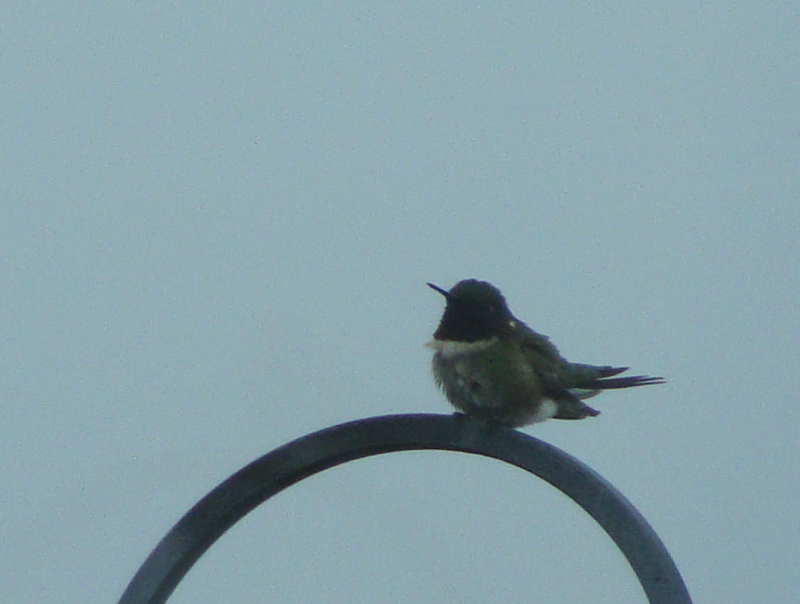 Napoleon, the only ruby-throated hummingbird on the deck, takes command of the high ground on between heavy rain. He and the rufous hummingbirds constantly battle for control of the feeders. 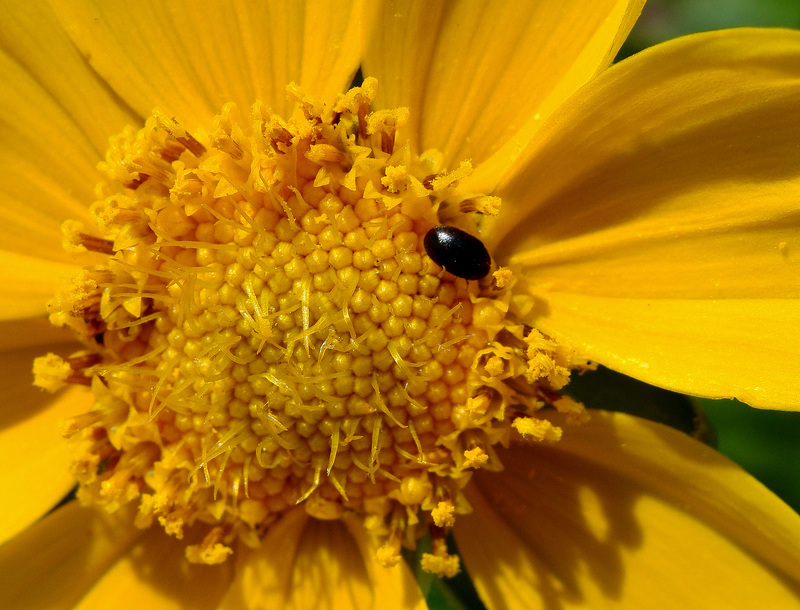 Coreospsis planted in 2010 bursts forth this spring in chrome yellow. 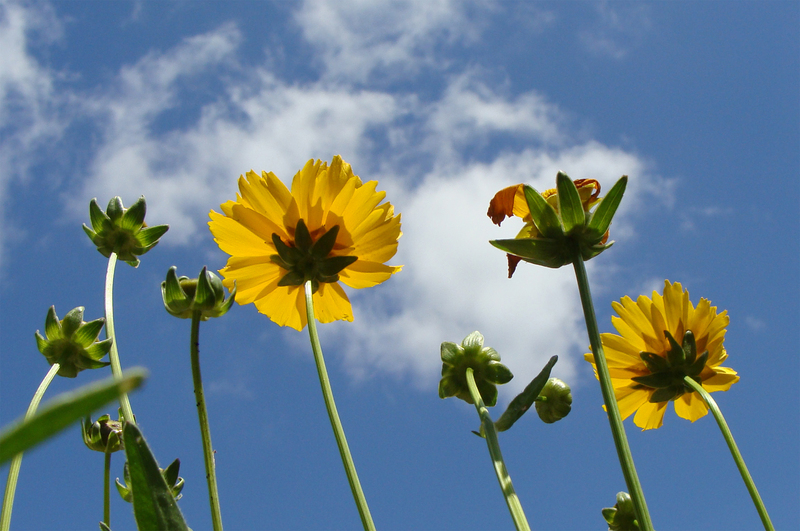 Brilliant yellow coreopsis look up toward the brilliant blue spring sky. Decided to try something different for the weekend brunch. Pancakes are pleasant, biscuits bountiful and waffles wonderful, but we were ready to have something else. 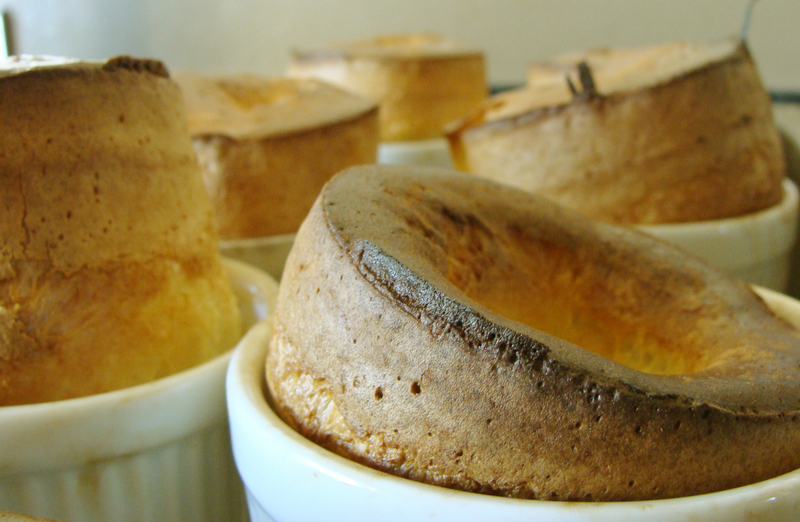 Popovers were the perfect quick start. Popover tops take rakish angles right out of the oven. Left leaning or right, they all tasted wonderful with butter and marmalade. The possum grapes are preparing for another year’s crop. 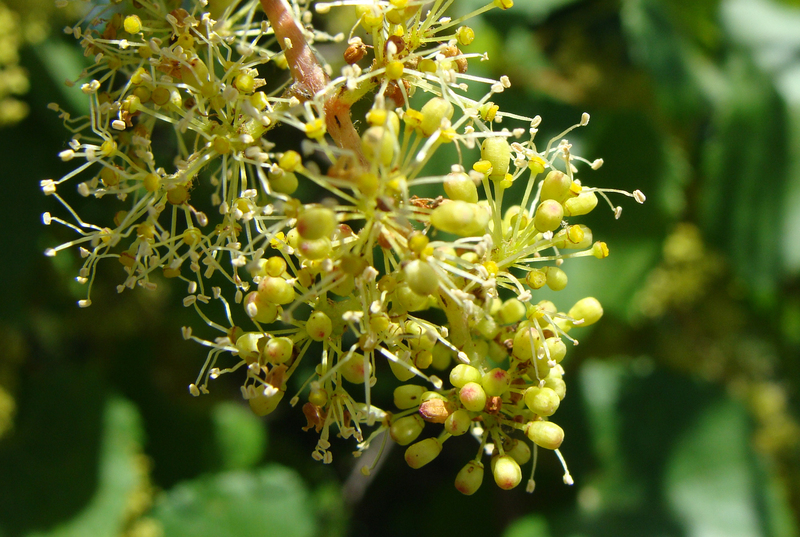 The flowers are out and ready to make baby grapes. Let’s hope the pollinators return with a week of dry weather. Future grapes bask in a long-awaited sunny day. Spring’s flowers’ shining faces turn toward the sun. 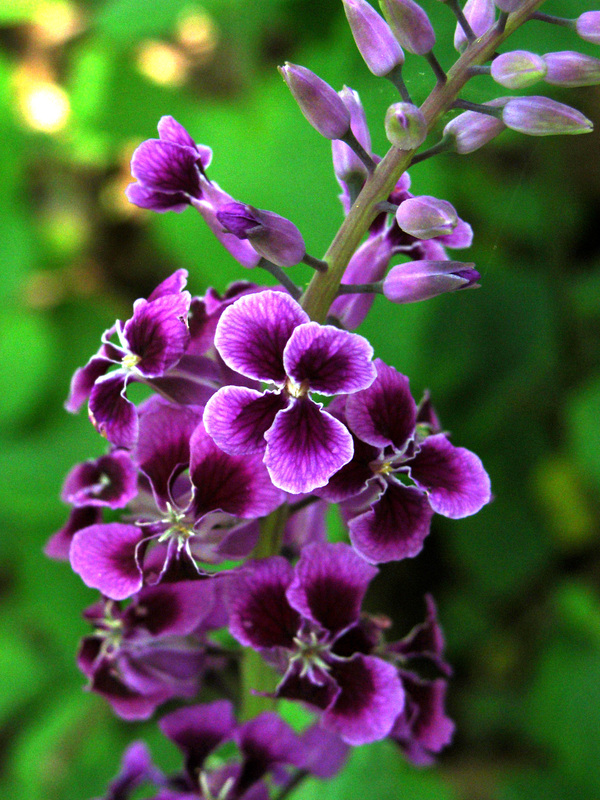 These beautiful spires of pink flowers with large oval leaves seem to have suddenly appeared in the woods. Hope to find out what these foot-tall plants are. Last year, we planted coreopsis and other annual wildflowers. The leaves came up, but no blooms. This year, the plants came back, thriving. Today, the buds burst open. After days of heavy rain, high winds and tornadoes, we awoke to something unusual: a sunrise. 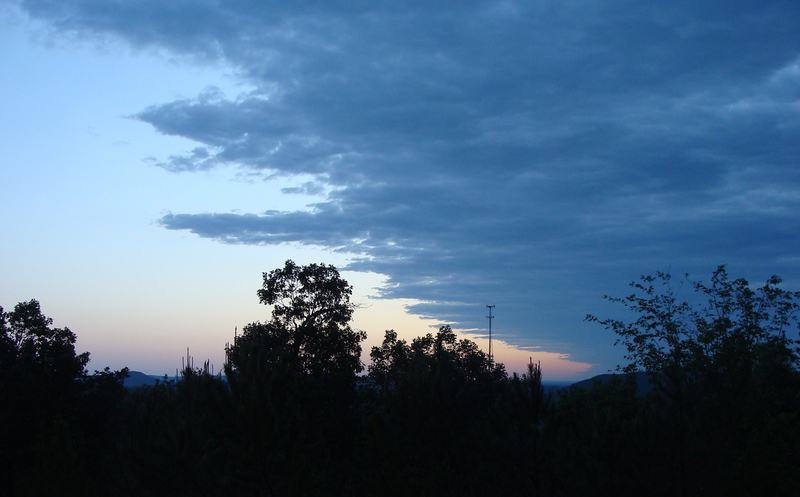 This sunrise also illuminated the back edge of the rainy front moving east and away from Arkansas. The ragged back edge of a clipper moves east and away from Arkansas, in this shot looking north. Springtime means rough weather for the middle of the United States. The jet stream changes allowing warm moist air from the Gulf of Mexico to meet cold air from the north and west. The resulting weather is at least turbulent. At worst, deadly. Since April 14, the South has seen the worst, including one of the largest tornado outbreaks in history that left hundreds of people dead. 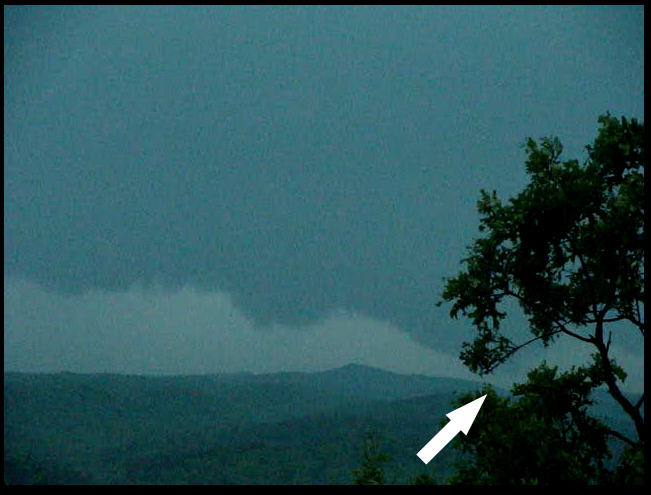 A funnel cloud, partially obscured by the tree silhouette, had been bobbing up and down for some minutes. It went west of us, and may have been the killer tornado that hit Vilonia, Ark. 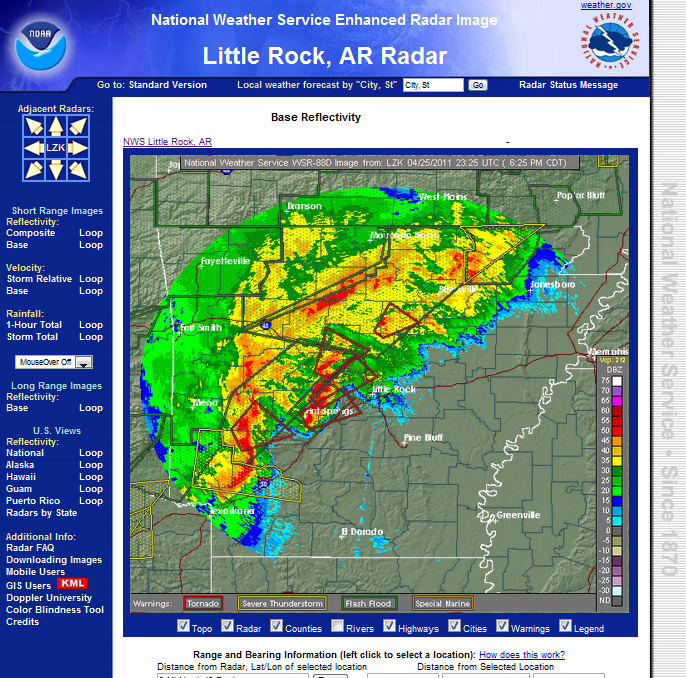 A screen shot of the National Weather Service radar map shows the line of storms. Each red polygon indicates a tornado warning. Green indicates a flood warning. Today, May Day, the storms continue. With this round, wind is not as much of a threat (so far) as water has become. 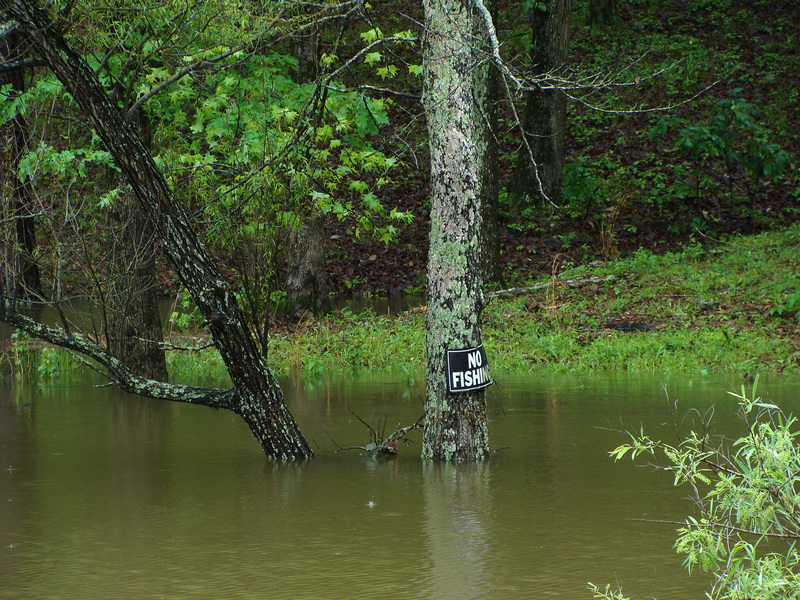 Normally, the tree holding the "no fishing" sign is on a dry bank. 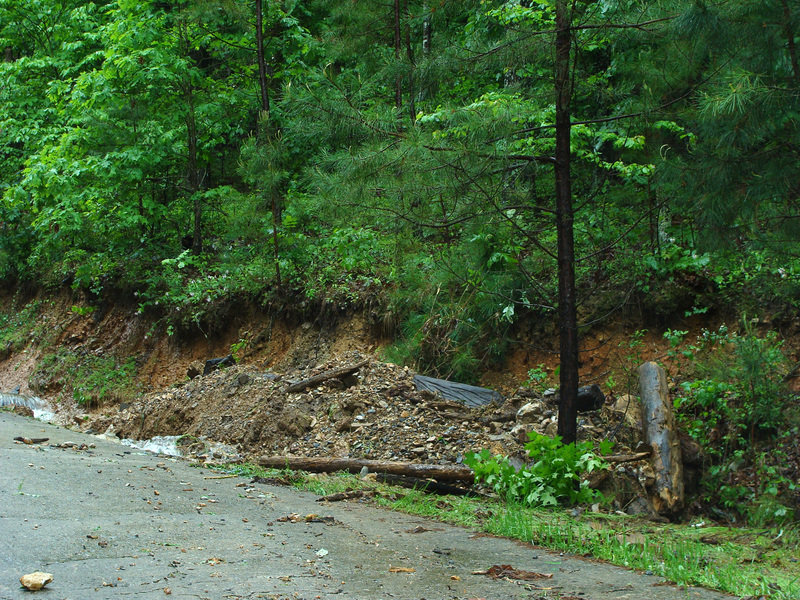 An inch of water in a short time cascading down a steep and saturated slope, created a 4-foot pile of debris, that included logs up to 6 inches in diameter.